I found a container of fresh currants and immediately thought of this recipe that I had saved to try once day as the combination of sweet and tangy really appealed to me. The recipe calls for dry currants, but the addition of some fresh really perked things up. Roast the bell peppers directly over a gas flame or under the broiler, turning, until charred all over. Transfer to a bowl, cover with plastic wrap and let cool. Peel, seed and core the peppers. Meanwhile, soak the currants in 1/2 cup of hot water until plump, about 5 minutes. Drain and transfer the currants to a blender. 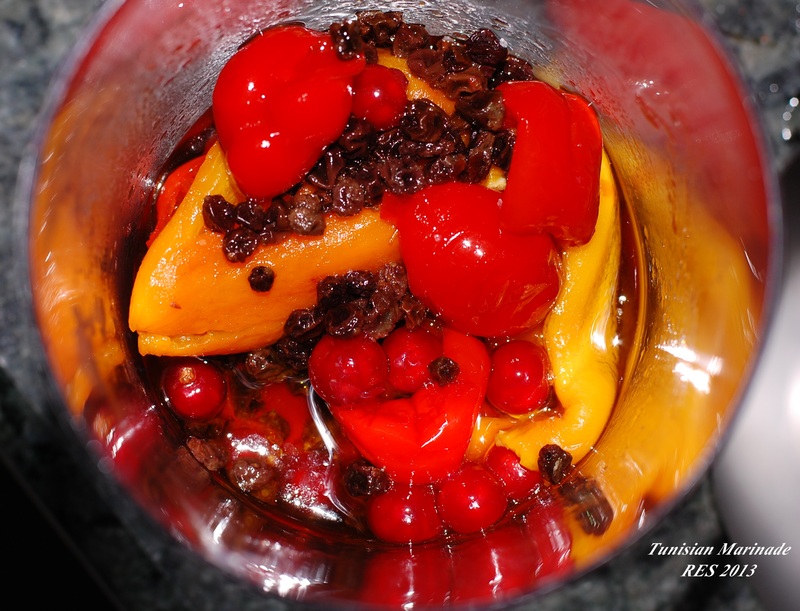 Add the roasted peppers, Peppadews and their liquid and the 1 cup of olive oil and puree. Season the marinade lightly with salt. Thread the chicken breast and thigh strips separately onto 30 to 40 bamboo skewers and transfer to a large rimmed baking sheet. Pour half of the marinade over the chicken, turning to coat completely. Refrigerate for 4 hours. Refrigerate the remaining half of the marinade in a serving bowl. Light a grill. Remove the chicken from the marinade, letting the excess drip off. Season the chicken with salt. Oil the grill grates and grill the chicken skewers over high heat, in batches if necessary and turning with tongs, until lightly charred and cooked through, about 8 minutes for the breasts and 10 minutes for the thighs. 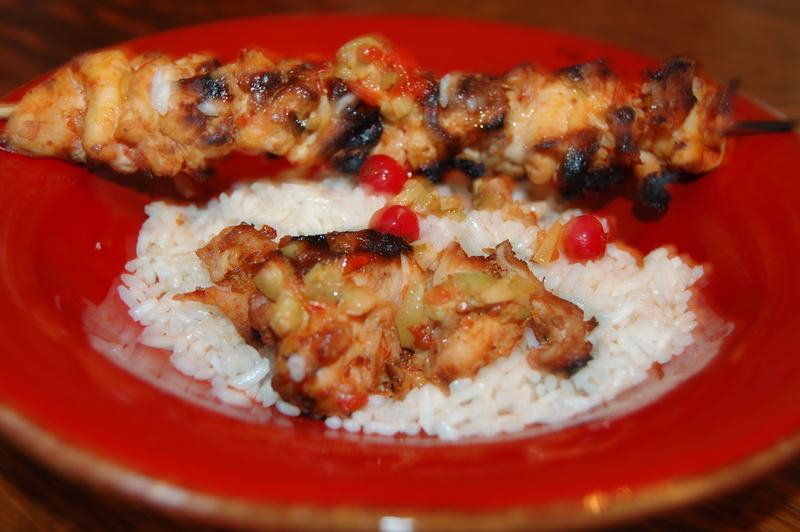 Serve the kebabs hot or at room temperature with the reserved marinade and the Tunisian Relish. MAKE AHEAD The marinade can be refrigerated for up to 4 days. ¼ cup fresh currants 3/4 cup dried currants 2 cups pitted green olives, chopped 1 cup sweet Peppadew peppers, chopped 1/2 cup extra-virgin olive oil 1/4 cup sherry vinegar Kosher salt In a bowl, soak the currants in hot water until plump, about 5 minutes. Drain, pressing out the excess water. 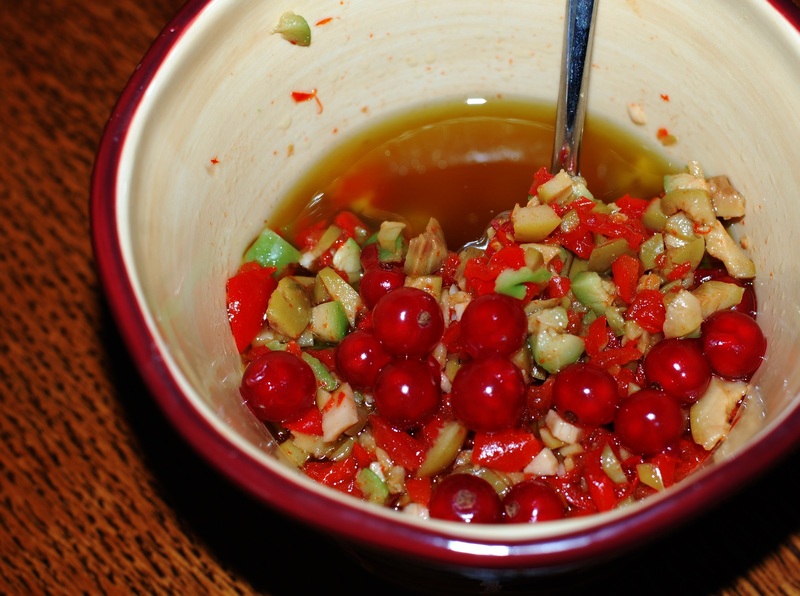 Return the currants to the bowl and add the olives, Peppadews, olive oil and vinegar. Season the relish with salt. If the relish is too tart for you stir in a little honey. MAKE AHEAD the relish can be refrigerated for up to 2 days.